Set your '06-'10 Dodge Charger apart from the rest with this "Hockey Stick" style body side graphic set. Available in a wide variety of colors, graphic measures 57.575"x 22.341" (146.24cm x 56.75cm) and is packaged with one (1) left and one (1) right side graphic. Graphic is designed to simply install at the top body line as shown and is precut for rear door jambs and fuel door - NO TRIMMING required! 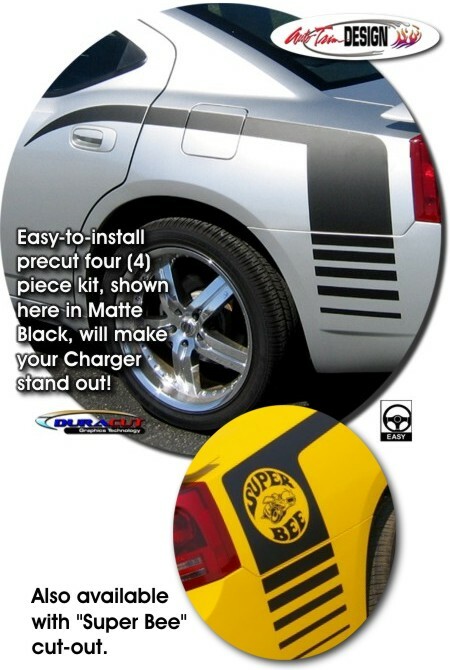 Choose from a solid graphic, cut-out for "Super Bee" decals or personalize it with unique wording. Simply enter the Custom Wording of your choice (up to seven  letters/digits/spaces) and we'll make it happen. Either way it'll look Terrific! Note: While "Super Bee" artwork is shown in image, Super Bee decals ARE NOT provided with the "Super Bee" Cut-Out kit. We merely provide an open area where the decals may be placed. Left (part #68004411AA) and Right (part #68004410AA) Super Bee decals are available from your local Dodge dealer.